St. Patrick's Day is just around the corner, and I'm not gonna lie, I don't really eat too many traditional Irish foods (Corned Beef and Cabbage - not a fan!) While I do have some Irish blood in me I like to celebrate somewhat, plus it's a fun holiday to celebrate with some fun with friends and green beer, I figured the best way to celebrate was with baked goods! 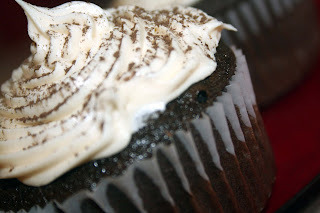 I've seen a lot of blogs with Irish Car Bomb* Cupcake, which sounded fantastic, but just a little too rich for my taste since chocolate is not always my favorite, so I'm combined a few recipes I found to create my own. 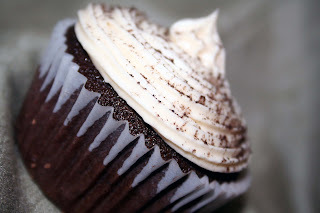 I took this Guinness Cupcake recipe with the Bailey's buttercream used in the Irish Car Bomb cupcakes and the comination of the two was fantastic. I could have used the cupcake recipe that everyone else used from Smitten Kitchen and just not filled with the whiskey ganache, however to be honest I liked that the Nook & Pantry recipe used a full bottle of Guinness, rather than just a cup. My husband however made sure to joke that he asked me to pick up a 6-pack of Guinness, not a 5-pack! * Disclaimer - I have nothing to do with the naming of the cupcakes, or the drink in which the cupcakes are named after. Bake at 350 degrees F on the middle rack for 20 – 25 minutes. 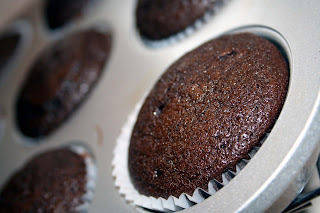 A toothpick inserted into the center of a cupcake in the middle of the pan should come out clean. Make sure to rotate the pans halfway through baking. Brush the tops of the cupcakes with a little of the whiskey. Set on a rack to cool to room temperature before frosting.